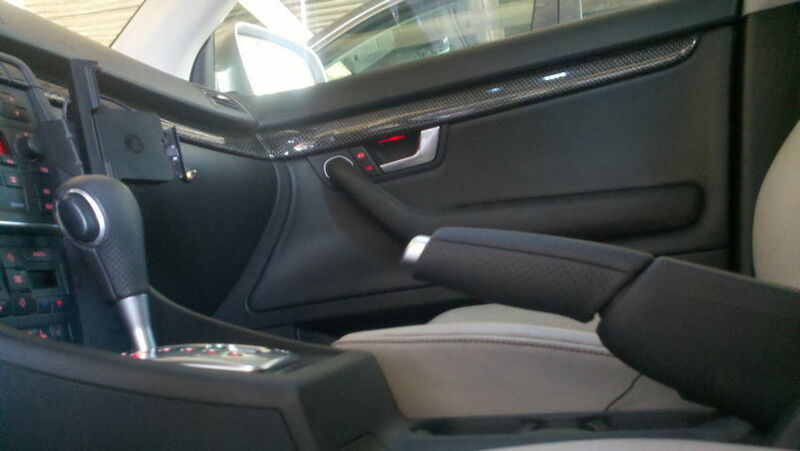 The stock Audi A4 or S4 E-Brake handle doesn’t have perforated leather, which is a shame. If you have a S-Line, UltraSport Package or the S4 package on your B6 or B7 body style A4 or S4, your steering wheel and shifter probably do have air leather, while the emergency brake is still smooth leather. It’s not a big deal, and most people won’t notice the difference, but adding the RS4 E-Brake Cover is a nice way to make everything match – it’s all in the details. You can find them for around $100, carried anywhere that sells OEM Audi parts as well as many discount retailers, audi parts dismantlers, or even eBay. Installation is super simple – all you need is a smaller flat head screw driver and about 10 minutes. I’ll walk you through it step by step, but the key is to go slow so you don’t damage the plastic on the emergency brake lever or the leather itself. To install, first pull up the e-Brake handle as high as it will go, putting the car in extreme brake mode. Next, press the metal tab downwards on the underside of the cover – you can see what the tab looks like in the picture above. 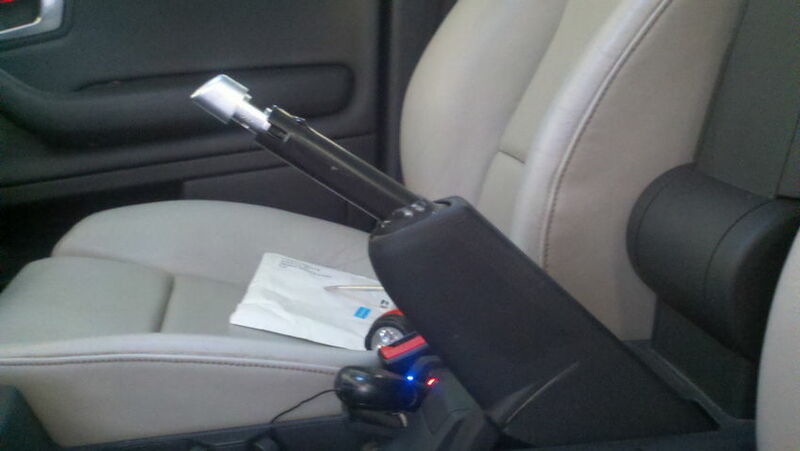 It snags on a clip on the emergency brake handle, so you’ll have to press down a bit to get it unstuck. 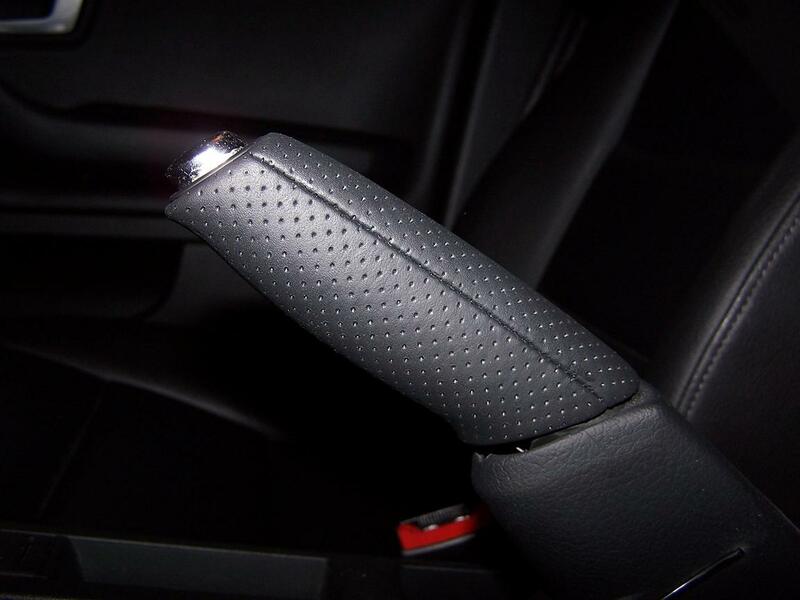 Once you pop out the tab, the smooth leather e-brake handle is now free to be removed. Slide it off using firm pressure, it is a very snug fit so you will likely have to pull at it and wiggle it back and forth to get it loose. In most if not all cases, that handle has been stuck in place for many years, but it will break loose eventually. Once your old hand brake cover has been removed, place it aside in case and store it somewhere in case you ever want to return back to stock. This is also a good time to clean the underside of the emergency brake lever, as you can get in the crack between the bottom half and the handle in a way you normally wouldn’t. Once you’re ready, remove the new perforated air leather e-brake handle from the packaging it came to you in, inspect it for any issues, and then slide it on. Like before, it will be a snug fit, so wiggle it down until the metal tab lines up with the clip and “snaps” into place. You don’t want this coming loose when using it, so make sure you feel it lock into place. You’re all done! Now is a good time to detail your interior and then enjoy how good it looks. You can see here the RS4 E-Brake cover looks great and matches the other OEM air leather/perforated leather parts very nicely. It’s a subtle detail few will notice, but if you’re anything like me, the subtle details really add up to make a big difference. You’ll also notice that your original leather handle starts to get worn out from the oils on your hands, so even if you didn’t care about the air leather it’s nice to refresh this part from time to time. If you do happen to run into any issues, leave a comment below and I’d be happy to help! Sorry to hear that Anthony! The A4 is here to stay, don’t worry 🙂 And happy hunting for a new Audi, there are some great deals out there for B7s IMO.